I originally posted these tips 5 years ago! Things have changed a lot in the world of yard sales, so I thought I would clean this post up and add in some additional yard sale tips and remove a few things that no longer work. A yard sale can be a great way to earn some good money and clean up and organize your house while you’re at it. Check out this post for garage oraganization ideas or pantry organization ideas to help motivate you towards your organization goals. I think having a yard sale is fun, but in order to have a successful yard sale and make the most money possible they can also be a lot of work. A good yard sale takes some time to plan, maybe more than you think. Be ready for a little work or get a lot of hands to help you out and make the work load a little lighter. I have had about 6 yard sales plus an indoor yard sale that lasted 10 days straight before we moved to Alaska. I’ve learned a lot of things along the way and I’ve made a lot money from yard sales (I paid for my daughter’s birth with yard sale money!) so I’m happy to share these tips with you. Go room by room in your house and gather things you don’t use any more. Having a yard sale is a great way to motivate yourself to finally get rid of junk in your house. There were things that sold at my yard sale that I didn’t think anybody would be interested in. People bought old magazines and calendars, half used gallons of paint, furniture that was falling apart, really ugly clothes and old shoes. You never know what people will buy, so if you want to get rid of it, put it out there. Make sure you are honest though, if you know something is broken, add a note to it so people know and price is really low! If there is a part missing they might be able to find it online or I had some people that didn’t mind spending a little money on something to see if they could fix it and make it work–just make sure you’re honest about it. The bigger your yard sale is the better chance you have to make a lot of money so ask friends and family if they have anything they would like to donate to your yard sale. Most of my family members had a donation pile that they were saving in a closet or in the trunk of their car anyway, so they didn’t mind. My aunt donated half the stuff at my yard sale and it wouldn’t have been as successful without her. It was all stuff she was trying to get rid of anyway and she was happy to donate it to me. More people will get out of the their cars and walk around your yard sale if there is a lot of stuff. It used to be that advertising was one of the hardest part about the yard sale. I used to advertise my yard sales in our local newspaper (that makes me feel old haha) so I would have to plan weeks in advance. Now there are facebook yard sale sites that make it so easy to sell things and announce yard sales. If you aren’t part of your local facebook yard sale group, click on the search bar at the top of facebook and do a quick search. I’m not 100% sure there will be one for your city or area of the country, but the chances are pretty high. This is a great place to announce the time and address of your yard sale. Add a picture to your post so that people don’t scroll right on by. Posters are a great way to get people to your yard sale, but I honestly think with facebook sale sites that posters are becoming more and more unnecessary. I would still make a few, but a few years ago I would make about 20 posters! These days most of your yard sale traffic will come from good advertising online. But it’s still good to have a few to catch the eye of people who are just driving by. Put posters on the biggest streets near your home to get the most eyes on them and one at the end of your street. When you hang them up make sure there is an arrow pointing in the right direction. Use bright colors with bold, easy-to-read letters. You can even use your Cricut machine to help you make your posters! Now go through your stuff and organize it into sections. 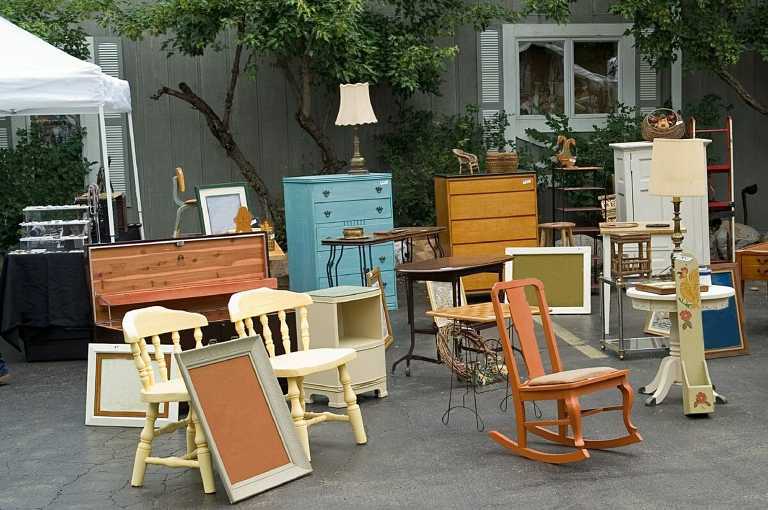 Treat your yard sale like a store, keeping similar items together. You will sell a lot more stuff, believe me! Some suggestions for the sections are: clothing, shoes, kitchen items, office items, holiday decorations, home decorations, baby items, scrapbooking and craft supplies, movies, books, CDs, etc. Now that everything is organized make sure you display your stuff so people can see it and remember to keep similar items together. Put your clothes on clothing racks or rope tied between two trees. For baby clothes I used bins, but separated them in sizes and gender. I would have people that would bring the whole bin up to me and buy everything, just because it was organized. Put your books or movies on a bookshelf so people can easily see the titles. I found that people will dig through bins if they are clearly labeled with what is in them and they are organized and they aren’t overflowing. Treat your yard sale like it is your business. Keep it clean and organized and easy to shop and people will buy things. When you are deciding on prices for your stuff just keep in mind that it is used stuff. Try not to think about your precious memories associated with each item. Nobody coming to your yard sale cares that your son wore that adorable romper in his 6 month old photos–to them it is used baby clothes. Some of your stuff may seem priceless to you, but don’t price it that way. I have been to yard sales where the prices were so high that I just turned around and left and then I’ve gone to some where the prices were so good that I ended up spending way more money than I anticipated. If you want to make money on your yard sale, price your items so they will sell. Think about what YOU would spend on an item if you were buying it at a yard sale. You can buy little round yard sale stickers in the office supplies section of any store, but you can also use painters tape or cute little price tags if you are super ambitious, just make sure to have them clearly visible. Have extra price stickers available just in case. Start with at least 10 one dollar bills, 2 five dollar bills and a roll of quarters. You will end up with more quarters and dollars at the end of the day, but if your first customer hands you a twenty dollar bill for an item that’s .50, what are you going to do? Also, just as a warning, don’t accept large bills, they might be counterfeit. I’ve heard stories where a counterfeit bill will be used on a cheaper item to get change back. Watch your back. Yes, that says fanny pack. I felt more comfortable with my money in a fanny pack than in a register at a table. I was okay taking a hit in the fashion department for the morning because I knew people wouldn’t be taking my money. I found a fanny pack at a thrift store for under a dollar! Also keep a calculator in your lovely fanny pack, just in case. I’m good at math, but found myself seriously struggling when I was trying to figure out change with ten other things going on around me. Have a friend or a relative come help you out. Somebody that can run to the store if you need more change or somebody to run and get lunch. It’s also a good idea to have an extra set of eyes watching your stuff. Unfortunately I’ve had yard sales where people stole items from me (add angry eye roll here). The extra set of eyes will help. This is more of a suggestion, you don’t have to do this, but if somebody is unsure if they want an electrical item have some place where they can plug it in to make sure it works. I had an outlet in my front yard, but you could also have an extension cord plugged in your front room and brought into the yard. 12. Turn off the sprinklers! Don’t let your sprinklers run the night before. Not only will you have wet feet if you do, but with all the added traffic on your lawn it will get muddy and will ruin your grass in some places. I suggest throwing your yard sale all weekend. It’s a lot of work the first day, but the following days are a lot easier and you might as well take advantage of it. You’ll already have the hard parts (organizing and pricing) done. Make a weekend out of it. The most money I ever made on a single day was on a Friday. Just as a kindness to the shoppers, have some grocery bags that they can use to put their stuff in. 15. Clean up your signs! Don’t let your yard sale signs become litter. Remember where you hang them up and make sure you gather them all up. Since you took the time to clean up all the clutter and unwanted items in your home for the yard sale make sure when it’s all over to donate it to Goodwill or whatever thrift store is nearest to you. Not only do you not want that stuff back in your house, but you will be helping somebody out. Good luck with you yard sale! Let me know how it goes!